The entrance to Abou Elie is through a flimsy sliding door at the base of the Yacoubian Building in Ras Beirut. If you didn’t know it was there, you’d never find it. Almost invisible to the casual observer, it is nevertheless one of those quintessential hole-in-the-wall bars; all dim-lighting, revolutionary imagery and the remnants of Lebanon’s civil war. Inside, hardly a patch of wall can be seen. Photographs, banknotes, newspaper clippings, guns, ammunition belts and flags cover every surface. Just above the bar, Fairuz can be seen sipping coffee and delicately holding a cigarette in her left hand. 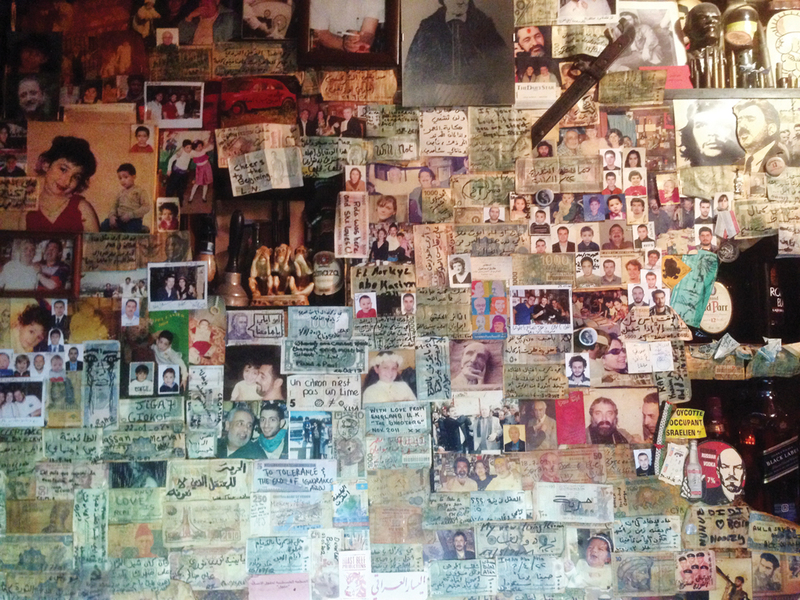 An array of pictures, many presumably of former members of Lebanon’s various militias, are pinned to the wall behind the bar, as are Saddam Hussein, who adorns an Iraqi banknote, and Lenin. Che Guevara is everywhere. It’s just gone midnight when we arrive, and Ernesto, Abou Elie’s son, is serving arak to a handful of customers in a room with no more than five tables. The sound of Jack McDuff and Inell Young float softly through the air, and before long a beautiful member of our group, her dyed red locks tied into a ponytail by a strand of her own hair, has made herself at home behind the bar. She pops in and out of conversations, laughs, takes orders, and listens to stories. One is of the civil war. 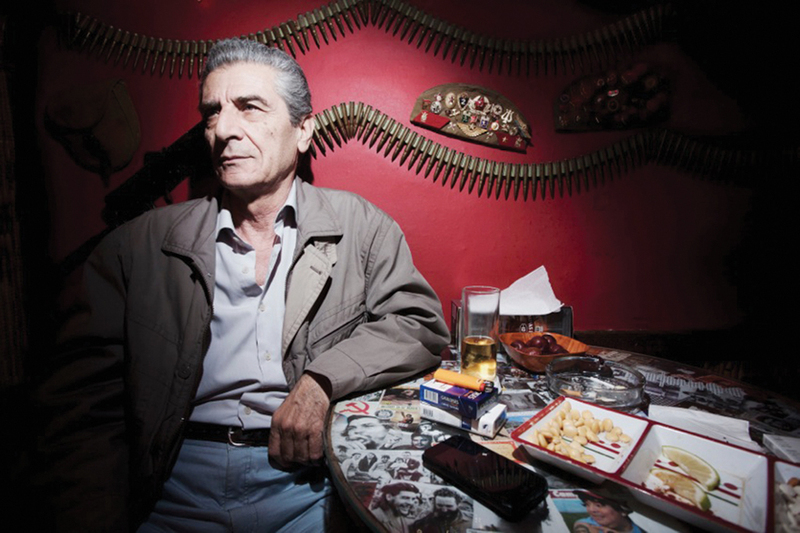 Sitting side-on to the bar, a middle-aged man recalls the struggle for possession of the Holiday Inn, whose bombed out concrete carcass remains as a monument to Lebanon’s violent past. He remembers a particular comrade. He remembers the Lebanese National Movement and the Palestine Liberation Front. He remembers many things before the woman with the red hair says that his former comrade’s son is sitting behind him. In disbelief, he turns around and his eyes begin to water. 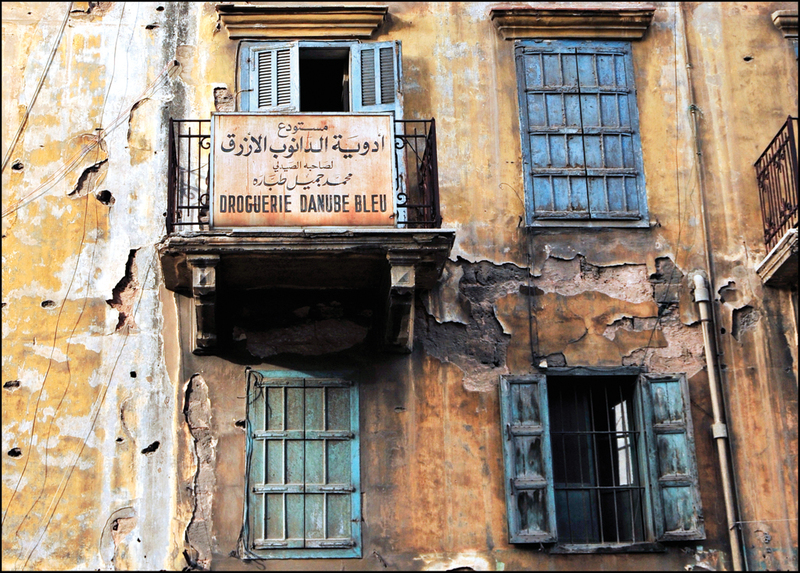 Beirut is filled with stories. There’s another, told to me in private, of a young girl and her family fleeing Beirut by boat in 1982. It’s of a girl, perhaps four years old, eyes etched with fear and uncertainty. She stands, amid a life’s worth of suitcases and memories, waiting alone. Patient through necessity, with curls and eyes that melt the soul. Now there are thousands of newly imported stories. Stories of Syria, and of refugees and beggars. They are scattered along the pavements of Hamra Street, outside the bars frequented by revellers at pubs such as Dany’s, where one night, in typical Beirut fashion, we bump into friends from Dubai by chance. Or at Bobo’s in Estral Alley, where the measures break all internationally recognised standards of size. Where a single is a triple and the party appears to continue all night. Now, the girl with the red hair is sitting opposite me. She is with a friend who has a streak of colour in her hair. Together they are a bundle of smiles and chatter as they consume the dishes before them: sujuk sausage, spiced potatoes, hummus, tabbouleh and fattoush. It’s 1.30am. These may be testing and troubled times for Lebanon, but the city refuses to relinquish its right to have fun. On the drive back to Clemenceau the laughter is hard to contain. The three of us are squashed into a tiny two-door city car, red hair streaming from the car’s retractable sunroof as she perches precariously upon my lap. The streets are all but empty and I can barely move, but the driver sings wildly to Led Zeppelin as we approach an army checkpoint with all the grace of a gypsy wedding. A short, heated discussion takes place without my voice, before precaution wins and we turn left to avoid unwanted questions. Beirut is a city I love. It often strays the wrong side of chaos, but that’s part of its charm. Frequently intoxicating, it never really attains the level of beauty it aspires to. Its decayed French colonial architecture, concrete eyesores, bullet holes, construction sites, dilapidated apartment blocks and potholed roads drag it back to reality with the frustration and self-loathing of a jilted bride. A friend once said that Beirut is as poetic as it is tragic. She always wanted to run after it. To fix the seams of its dress and to straighten its crooked bow tie. But if you take away the tension, the angst, the volatile mix of people and religions, its many flaws and blemishes, you’re left with just another Mediterranean city. It’s early afternoon the following day, and as I walk along the main thoroughfare of Hamra, the sounds of Fairuz and Umm Kulthum periodically reach me above the squeals and groans of congested traffic. Hamra Street, one of the city’s main economic hubs, jostles for your attention while being simultaneously oblivious to your presence. 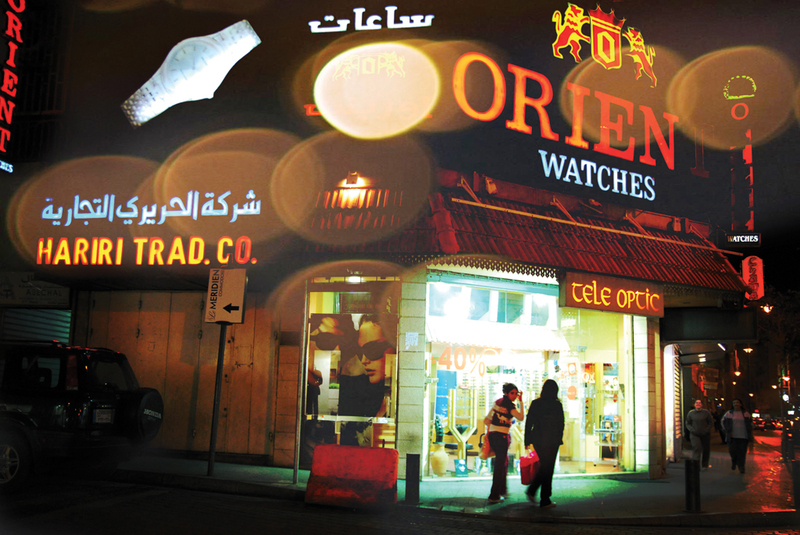 Shops, cafés, shawarma and falafel stands, female beggars and their children, shoeshine boys and courtyard restaurants fill the senses. Metro Al Madina is also here, tucked quietly away beneath the Al Madina Theatre, itself a reminder of Hamra’s cultural past. Bourj Hammoud, a predominantly Armenian area renowned for restaurants such as Varouj, is a fascinating oddity. Somewhere along the lines a fashion experiment has turned sour and taken on a life of its own in this enclave of rash and hasty sartorial decisions. The word kitsch fails to do many of its inhabitants’ justice. The same word also fails to do justice to Souk Al Ahad, a madhouse market held beneath a motorway flyover in Sin El Fil. More popular than ever due to the huge influx of Syrian refugees, this assault on the senses is in many ways a microcosm of Beirut. Loud, incessant, chaotic and bizarre, people’s lives are littered across its cramped and dishevelled floor in increasing density. Old letters, photographs of forgotten families, tasteless paintings, telephones without chords, bells that don’t ring, faded postcards and the detritus of life lie for sale alongside chickens, canaries, and the kind of plastic tat China produces without end. Stallholders sell sweets and nuts and corn on the cob. There are shoes everywhere. Shoes and clothes. There’seven a man operating a single sewing machine to great demand as endless crowds of men swarm past. Eventually we head to Mar Mikhael and to Internazionale, a bar just up the road from Ernesto’s regular haunt – Radio Beirut – to meet an old friend. Glad of the drink after a long day, we chat away, occasionally popping outside to smoke in the street surrounded by young men and women beginning to paint the town red. Peppered with long sets of iconic steps, Mar Mikhael is one of Beirut’s genuinely beautiful areas. Many of the steps have been painted by a group called the Dihzahyners, and as we climb various sets towards a party we were invited to earlier in the day, Beirut begins to slide into focus. On a rooftop an hour or so later, a sense of peace and serenity descends. As the party plays out below, all around is dark; the blackness of night punctuated only by circles of golden light radiating from the occasional streetlamp. The girl with the red hair is with me. And for once we are alone.